Feed the homeless, defeat the unjust! You are SupperMan! 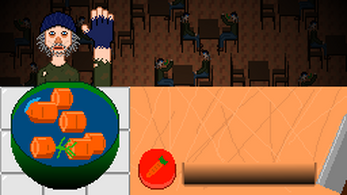 Click the carrot button, chop the carrot, sweep the pieces into the bowl, throw the soup bowl at people! Aim for homeless people's hands to feed them, but some of them are actually villains in disguise! If you see one of those, smack the soup right into their evil faces! Get it on the Google Play Store! Windows: Download SupperMan.exe and run it. Android: Get it on the Google Play Store or download SupperMan.apk and install it.